1.Cresap’s Rifles Post 78 meets the 2nd Wednesday of each month (except December) at 7:00 p.m. Our meeting room is located at the William Talley Recreation Center (old armory) at the corner of West 2nd Street and North Bentz Streets in Frederick, Maryland. 2. Post 78 is heavily saturated with former members of the 115th Infantry. However, in past years, we have become much more segregated with individuals from other units. Prior to World War II, the Regimental Headquarters Company, Company A and the Regimental Band were all housed at the old Frederick Armory. 3. The Current List of Officers was installed for a period of two years in 2017. Welfare Officer – PPC John Wilcox, Jr.
a. Placing 29th Div. Assoc. flags on the graves of deceased 29er in 36 cemeteries in Frederick County. This is done just prior to Memorial Day each year. b. We are always looking for ways to improve and enhance the MG Boyd M. Cook Memorial Grove located at the Michael Cresap Armory in Frederick, We have initiated a program to have pavers laid in the shape of an “A” on each side of the front entrance to the armory. Pavers are engraved with a message supplied by the purchaser that covers no more than 3 lines with 15 characters per line. A donation of $75.00 is welcomed. Only limited space is available. c. Post 78 initiated a program during the Christmas period in 2013 to deliver small gifts to all service veterans residing in nursing homes in the City of Frederick. This program has expanded over the past 4 years and we are now making deliveries to roughly 160 veterans each year. d. Post 78 holds three social function for the benefit of the members each year. The Spring Fling is a sit-down dinner that is conducted each April. The Family Picnic is held in August each year and we normally conduct our annual Memorial Service at this time also. A plaque, honoring a selected former member of the 29th Division is awarded to the nearest living survivor with an identical plaque hung in our meeting room on a “Wall of Honor”. Our annual crab feed is held in October and has always been held at the Michael Cresap Armory in the past. 7. Post 78 is one of the few active posts in the Maryland Region and welcomes all new members. While many of our current members were originally from the 115th Infantry Regiment, we do have many members from other units and welcome all. We also seek widows, children and grandchildren of former members of the 29th Infantry Division as regular members, as well as those of other branches of service who may join as Associate Members. 8. 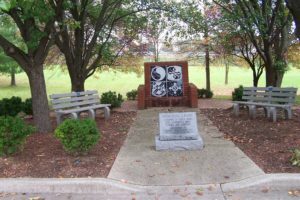 The monument, located at the MG Boyd M. Cook Memorial Grove was dedicated on May 9, 2009 at the Michael Cresap Armory in Frederick. A plaque located close by was put in place later on.